The Angler of the Year (AOY) tournament took place in Young Harris, Georgia on Lake Chatuge. The top 50 anglers in the Bassmaster Elite Series AOY points fished on this small body of water, which is about 7000 acres. Although 7000 may sound big, these anglers are used to fishing on waters up to 450,000 acres. Due to the smaller sized lake, it is important for the fishermen to find specific areas and race to their spot to insure they arrive first to catch big mama. Going into the AOY tournament, Chad Pipkens was in 39th place, which put him on the “bubble” in qualifying for the Bassmaster Classic in March 2019. Out of the AOY tournament this year, the top 36 anglers in the points go to the Bassmaster Classic. With that being said, Pipkens would need to have three good days on the water at Lake Chatuge to move up inside the top 36.Pipkens had a good start to the tournament, however he finished with 26 lbs. 5oz. and in 36th place in the tournament. Unfortunately, since anglers who were behind him in the points finished above Pipkens in this tournament, he moved back to 44th place in the points and fell out of contention for the Bassmaster Classic. Lucky for him, he has two more opportunities to qualify to the world renown “Super Bowl of Fishing”. Pipkens fished the Eastern Opens this year, and finished 9th in the Opens point system out of 200 plus boats. For the first time in history, B.A.S.S. is having a championship for the Opens series. Top 10 in the points for the Easterns and Centrals will go to the championship, as well as the 8 Open winners throughout the year. Out of this tournament, the top 3 in each division will go to the Bassmaster Classic, as well as the winner of the tournament. Having this opportunity is one of the many reasons why Pipkens fishes the Bassmaster Opens Series. This tournament is held at Table Rock Lake in Missouri on October 18-20. Not only is the Opens Championship a route for Pipkens to qualify to the Bassmaster Classic, but the Classic Bracket is a way also. Anglers 37 to 53 in the AOY points qualify for this event, and since Pipkens is 44th in the points, he has another chance for the Bassmaster Classic. This tournament is at Carters Lake in Georgia on October 23-26, consists of 16 anglers, and three of them can qualify for the Bassmaster Classic. Check out www.bassmaster.com for more details. As many people are aware, there have been some huge changes in the tournament bass fishing world lately. Major League Fishing (MLF) created a new tour, the western tournaments on the Bassmaster Elite Series were moved to different lakes, and anglers were forced to make a few difficult decisions. The Elite Series. MLF and FLW tour are completely different in format, however they each contain the highest ranked bass fishing anglers in the world. 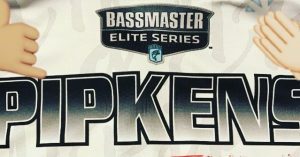 Although decisions are still being made, Pipkens officially committed to the Bassmaster Elite Series for 2019-2021. “Its a great time to be involved in tournament bass fishing right now. Lots of positive changes are being made for the angler. I am very excited to see where the sport takes us the next 5-10 years!” says Pipkens.